The Olympic medalist and five-time world champion stars in a new ad for Clay Pell, who's competing in Rhode Island's crowded Democratic gubernatorial primary on September 9. 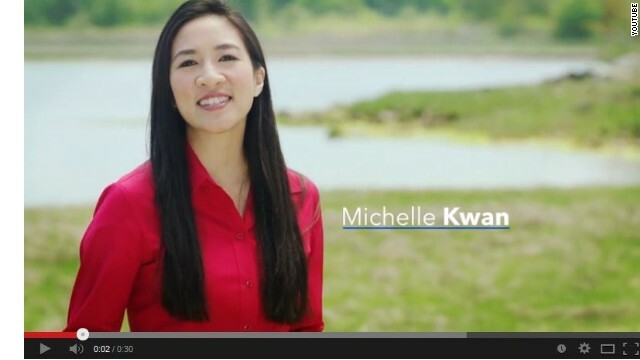 "One of the reasons I'm so excited about my husband Clay Pell's candidacy is because Clay is committed to a women's-equality agenda," she says in the new TV commercial. Pell, grandson of the late U.S. Sen. Claiborne Pell and a member of the Coast Guard Reserve, has worked as a deputy assistant secretary in the Department of Education in President Barack Obama's administration. He falls behind two other Democratic candidates in the polls, state General Treasurer Gina Raimondo and Providence Mayor Angel Tavares. With Rhode Island being a reliably blue state, the winner will likely fare well against the Republican nominee November. The victor of November's general election will succeed retiring Gov. Lincoln Chafee, a Republican-turned-independent-turned Democrat. A republican-turned-independent-democrat. Forget the party , Go where the money is. The trouble with all of these so called "equality" things.........is those seeking them are usually never satisfied with true equality, and are actually seeking special privileges instead. That's where the women's movement is now.........and that's exactly the problem with blacks in America, and I am just waiting for the illegal immigration thing to turn into exactly the same thing. Illegal immigrants get more rights than legal citizens. Clay Pell is the only candidate running Den or Rep who is not corrupt and self-serving . Rhode Island has had some crazy politicians . "The trouble with all of these so called "equality" things.........is those seeking them are usually never satisfied with true equality, and are actually seeking special privileges instead." Like what? Afraid to try your hand at an example because it gives us a target? "That's where the women's movement is now.........and that's exactly the problem with blacks in America, and I am just waiting for the illegal immigration thing to turn into exactly the same thing." "Illegal immigrants get more rights than legal citizens." Assuming these "people" have gotten all the equality you think they deserve: Back when white male rich guys had all the special privileges, what activities did you engage in to raise awareness and straighten that out? Women are a majority in this country. Whats the problem? But who is Nancy Kerrigan supporting? I can't possibly vote without considering her opinion. You might not be very smart Rick, but take comfort in the fact that you're a terribly accomplished attention getter as you know just what to say to rile up folks.....well at least MOST folks. I'm not biting. Too simple. BTW, you could've saved the Black and illegal portion of your statement for another post, thereby getting more bang for the few functioning brain cells you possess. So remember, next time buddy, less is better. In other words, he's a rich white kid that has led a charmed life, wanting for nothing and got paid a hefty 6 figure salary in the Obama administration to run and fetch the donuts and coffee every morning. And I'm sure he was appointed because of his family name and connections. Now what is the left always yammering in here about rich white privilege??? It just doesn't seem fair for you to discount Tonya Harding, as if her opinion wasn't equally important! Gotta love Rick McDaniel.....coming to you directly from the "Cliven Bundy School Of Elevated Thought". what next? is his mommy going to do an ad for him? maybe an animated recreation of his late grandfather endorsing him?! honesty junior, you need to man up and grow a pair before anybody should consider you to run the state! That might have something to do with their proximity to New Jersey, and it being a haven for mob types," it" being Rhode Island. Oh, hey. Michelle Kwan. My daughters and I got some very nice pictures of her receiving her gold medal in the 1988 World Skating Championships held in Minneapolis. If I remember correctly, she pulled that gold up by her skate-straps.